A bright-green installation now snakes through a formerly-dingy and disconnected alley in downtown Chattanooga, Tennessee. Designed by Syracuse, New York–based practice SPORTS, City Thread activates the 6,200-square-foot walk-through with 500 feet of linear steel that doubles as public seating. 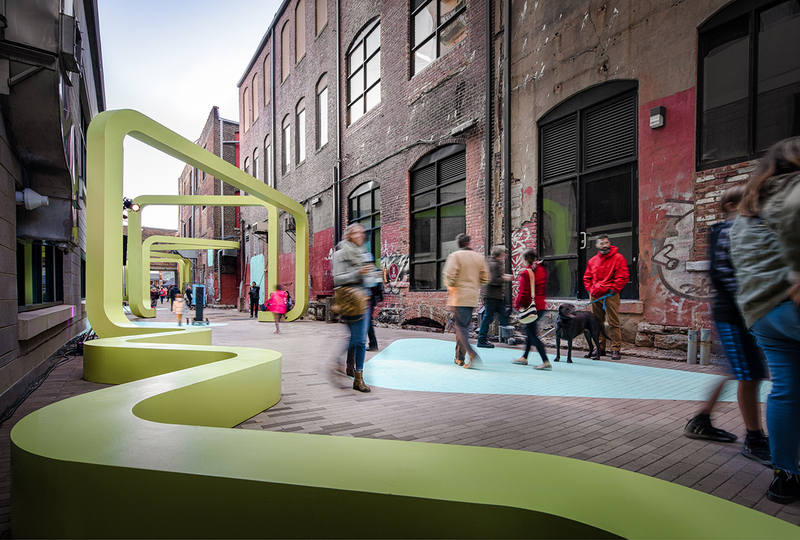 The project was born out of an international design competition, Passageways 2.0, in which architects were asked to envision a piece of contemporary urban infrastructure that would activate an alleyway in the Southern city’s core. Organized by River City Company, a local nonprofit economic development company, the program was the second iteration of a successful 2016 competition that imagined pop-up pieces in Chattanooga as well. SPORTS won Passageways 2.0 last summer, and with it, the chance to build City Thread as a permanent installation in the 300-foot-long passage known Cooper’s Alley off 7th Street in downtown Chattanooga. Led by Molly Hunker and Greg Corso, the award-winning, multidisciplinary practice collaborated with NOUS Engineering and Metal Arts Foundry on the project, opening the completed, zig-zagging structure last November. It’s now being marketed as a piece of “art-as-infrastructure” and a series of “urban rooms” that support a range of social activities, formal programming, and casual hangouts. To create City Thread, SPORTS was limited to a small budget of just $100,000 and asked to design around fixed elements within the alleyway such as AC units, grease traps, doors, vehicle access lanes, and fire hose hookups. The firm circumvented these barriers by building an adaptable installation that utilized a “kit of parts system of design and construction.” With only six formal elements—straight pieces of steel and five different corners, SPORTS created a seamless volume that conforms to the specific clearances in the alley. The result of City Thread is a new kind of city block for Chattanooga, one that puts pedestrians first and gives way to informal and planned opportunities for social connection. Hunker and Corso told AN in an email that Chattanooga, a city that’s known as a rising tech hub, is keen on building urban infrastructure that encourages both digital and personal connectivity. The “Gig City” is most famous for having the first publically-owned broadband network, a move that spurred economic development and boosted job creation nearly nine years ago. City Thread almost seems like a visual, tactile model of the ultra-fast, fiber-optic internet. It’s another kind of winding network that physically connects locals to one another. “There’s unbelievably strong support for creative projects, like this one, that bring people together,” said Hunker and Corso. “It’s been particularly exciting to see this new public space come alive with various different activities, and to see the various interpretations of the space by different people.” SPORTS was recently named AN’s 2018 Best of Design Award winner for Young Architects. Established in 2010, the firm has designed and constructed both large- and small-scale architectural installations around the country. Both Hunker and Corso currently teach architecture at Syracuse University. After a video of the moment went viral on Twitter, her challenger, Espy, called the remark “tone deaf.” The incumbent senator is defending it now as “an exaggerated expression of regard,” claiming it was taken out of context. She'll face Espy in a debate tonight without outside press or an audience present, reported the Jackson Free Press earlier today. Hyde-Smith’s poor choice of words, whether meant as a joke or not, represents the irreverent and ignorant way many Americans look back on the horrific lynchings that took place in the Jim Crow South. What makes this even more deeply inappropriate is that Hyde-Smith said this in her native Mississippi, the state that notoriously conducted the most amount of public hangings on record. President Trump is set to a hold rally in support of Hyde-Smith next Monday ahead of Tuesday’s election, but Democrats appear to be reinvigorated and could pull off another upset in the South. While we as a country have worked to acknowledge our harsh history of racial tension and inequality through monuments and museums dedicated to slavery, black culture, and the civil rights movement, we’ve barely begun to take the much-needed step toward memorializing the thousands of victims tortured, murdered, and hung in 12 U.S. states from 1877 to 1950. According to a new report by The Cultural Landscape Foundation (TCLF) entitled, Landslide 2018: Grounds for Democracy, numerous lynching sites in Shelby County, Tennessee, are virtually unmarked for their historical significance. Walking by these nondescript places, no one would know that hundreds of spectators once gathered there in carnival-like fashion to witness these unforgivable acts of racial terror. TCLF makes its case for the recognition of these places by digging into the lynchings of four African Americans in and around Memphis: Mississippi-laborer Lee Walker who was arrested and hung in 1983 for looking like a man who allegedly tried to sexually assault two white women; People’s Grocery owner Thomas Moss, and his employees Will Stewart and Calvin McDowell who all suffered fateful deaths in 1892 because a white grocer nearby instigated a rumor that the Stewart had injured him; cotton farmer Jesse Lee Bond who was shot, castrated, and drowned in 1939 because he asked for a receipt at a store; and woodcutter Ell Persons who was lynched and burned in 1917 after being accused of decapitating a 15-year-old white girl. While there aren’t any grave markers for these victims, their deaths have continued to echo through America’s development as a 21st-century country. TCLF noted that, according to Dr. Jacova Williams of Clemson University’s Department of Economics, southern counties that held more historical lynchings have lower voter registration rates among African Americans today. This sad reality must be altered, and TCLF argues the only way to do it is by shining a light on such sites and their jarring stories. It’s key to our country's ability to heal and move forward as a collective society, they say. “Our shared and fragile landscape legacy has a powerful role to play in helping us understand where we come from,” said Charles A. Birnbaum, TCLF President and CEO, in a statement, “especially in the current debates, conversations, and analyses of our national identity.” These Shelby County sites are listed among 10 other at-risk historic sites and landscapes associated with human and civil rights in the U.S. Laid out in TCLF's Landslide 2018 report, every site is currently in danger of being redeveloped or demolished altogether. Some simply suffer from a lack of resources, an equally foreboding issue that plagues communities and organizations trying to bring recognition to near-forgotten places around the country. Other sites, like those found in Tennessee, have long been suppressed. But things are changing. 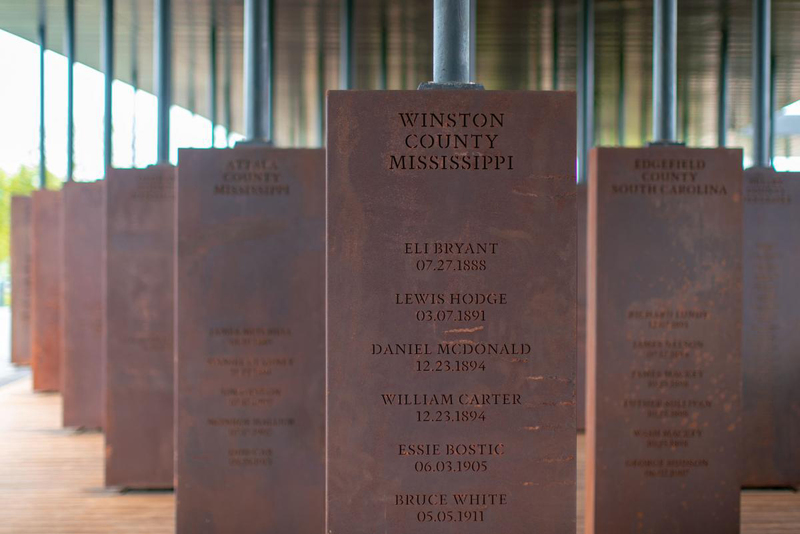 This summer, The National Memorial for Peace and Justice opened in Montgomery, Alabama, and was dedicated to the more than 4,440 African American men, women, and children who were hanged in the South. The memorial, built by the Equal Justice Initiative and designed by MASS Design Group, has been praised by visitors and design critics alike for its beauty, timeliness, and national importance. Architect and speaker John Cary, who authored the 2017 book Design for Good, has toured public projects around the world. He described the National Memorial as “one of the most extraordinary memorial buildings" he's ever seen anywhere. Others agree and are calling it the most significant memorial on U.S. soil since Maya Lin’s Vietnam War Memorial in Washington, D.C. While a massive work honoring those lynched in the South is an incredible step forward, it’s still important to preserve the other places where the lynchings actually happened. TCLF placed these sites in its Landslide 2018 program to call attention to their fading history and to urge Americans and preservation groups to help keep them intact. The other at-risk sites include: Blair Mountain Battlefield in Logan County, West Virginia, the site of a four-day uprising by over 10,000 armed coal miners fighting for basic workers’ rights; Druid Heights in Marin County, California, a bohemian enclave north of San Francisco where poet and lesbian feminist Elsa Gidlow lived among a group of LGBTQ activists; The Hall of Fame for Great Americans at Bronx Community College, a monument featuring 96 busts that honor high-achieving individuals across various fields; Hog Hammock on Georgia’s Sapelo Island, home to the last descendants of the enslaved Saltwater Geechee community; Japanese American Confinement Sites located across the West Coast where over 120,000 people were held during World War II; Lincoln Memorial Park in Miami, Florida, a 20-acre African American cemetery in Dade County housing soldiers from the Civil War to the Iraq War; Lions Municipal Golf Course in Austin, Texas, the first desegregated course in the South; Princeville, North Carolina, the first U.S. town incorporated by African Americans; and Susan B. Anthony’s Childhood Home in Battenville, New York. All of these landscapes have played a critical role in America’s growth and continue to shape how we interact with one another, as well as how we fight and vote for a less violent, more equitable future. Get the full story behind these historic sites and why they’re in danger here. Nashville, Tennessee, received an early Christmas present last year, in the form of a Major League Soccer (MLS) expansion club. Nashville was one of 12 cities with ownership groups vying for four possible expansion clubs, and on December 20, MLS made the announcement that the music city would be the first to be awarded a new team. Though the official announcement happened in late December, Nashville has been working toward a new team for well over a year. This includes plans for a completely new stadium. Early designs for the 27,500-seat stadium surfaced mid-2017, with plans to position the pitch in the Fairgrounds, home to the Tennessee State Fair, located in the Wedgewood-Houston neighborhood. While details about the stadium are still being worked out, HOK will lead the design, adding it to the long list of stadiums the international firm has worked on in recent years. The road to a new professional soccer team and the subsequent stadium has been a long one for Nashville. The 12 other cities attempting to secure an expansion team included Detroit, Cincinnati, Indianapolis, and St. Louis, just to name a few in the region. While the bid has garnered popular support from the city and state, not everyone was pleased with the proposed placement of the stadium. In late 2017, before Nashville had been awarded the expansion position, a local lawyer filed a lawsuit against Metro Nashville. The suit alleged that the city had violated its charter by proposing a stadium at the Fairgrounds, a park which is designated for the annual state fair and other public events. Just days before the official MLS announcement, a court sided with the defense and dismissed the case, helping pave the way for the team’s new home. While the stadium is expected to cost around $250 million, an additional $40 million will be spent updating the Fairgrounds, which are in need of numerous infrastructural improvements. A tentative timeline has construction beginning by the end of 2018, with the team’s first season starting in 2020. During construction, the grounds will remain partially open in order to continue hosting fairs, public markets, and events. Since 2004, 14 teams have joined the MLS. Nashville will be the 24th team in the league, which hopes to be up to 28 teams in the near future. For this round of expansion, Nashville set itself apart by pointing out that it had played host to a number of well-attended international matches in recent years. Though the club has not announced official colors, a logo, or even a name, the city council will soon be reviewing the stadium plans for approval. With the already-expressed support from the mayor, that process is expected to go well. Who knows? It may be only a matter of time before the sound of soccer chants, accompanied by steel guitars and fiddles, spill out of honky-tonks across the city. The city of Memphis, Tennessee, will be 200 years old in 2019. In anticipation of that milestone, the city is investing in improvements throughout the downtown and along the Mississippi. 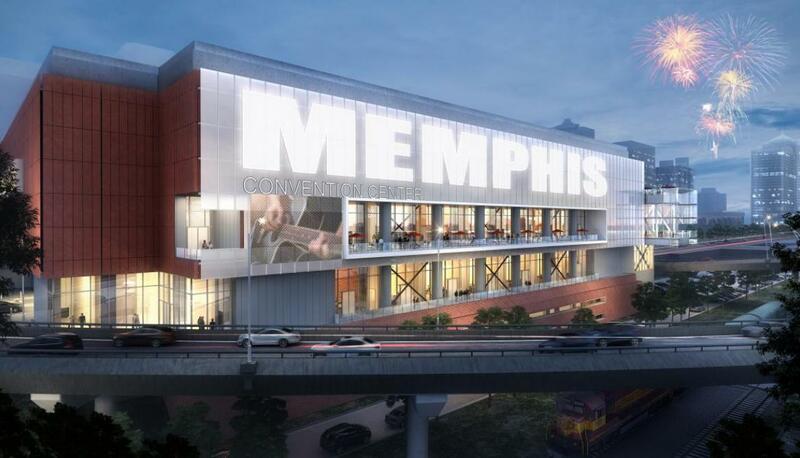 Along with redeveloping the Mississippi Riverfront, Mud Island, and the Pinch District, the Memphis Cook Convention Center renovation is part of the much larger citywide Bicentennial Gateway Project. Led by the Memphis office of Looney Ricks Kiss (LRK) and Atlanta-based tvsdesign, the overhaul will affect the entire complex, including the neighboring Cannon Center for the Performing Arts. In the first week of the year, the City of Memphis filed for the project’s first construction permit, which lists the budget at $175 million. That money will be drawn from a 1.8 percent hotel tax and Tourism Development Zone (TDZ) funds gathered from the convention center’s surrounding neighborhood. The most dramatic changes to the convention center will come in the form of an expanded footprint and outdoor terraces with views to the river and downtown skyline. New glazed concourses and meeting rooms will increase breakout space while providing more views of the city. In the 125,000-square-foot main exhibition hall, new retractable ceiling lights and additional material upgrades will allow for a 40,000-square-foot secondary hall to be carved out from the west end. The number of breakout rooms will also be expanded from the current 30 to 52. Access to the building will be updated with the addition of a new grand entrance and a new sky bridge. The new grand entrance will open to the Main Street Trolley station and neighboring Sheraton Memphis Downtown Hotel. The sky bridge will connect the convention center to the Sheraton. Back-ofhouse access will also be improved with a redesign of the loading docks. The neighboring 2,100-seat Cannon Center for the Performing Arts will undergo a complete cosmetic update, as well as backstage improvements. 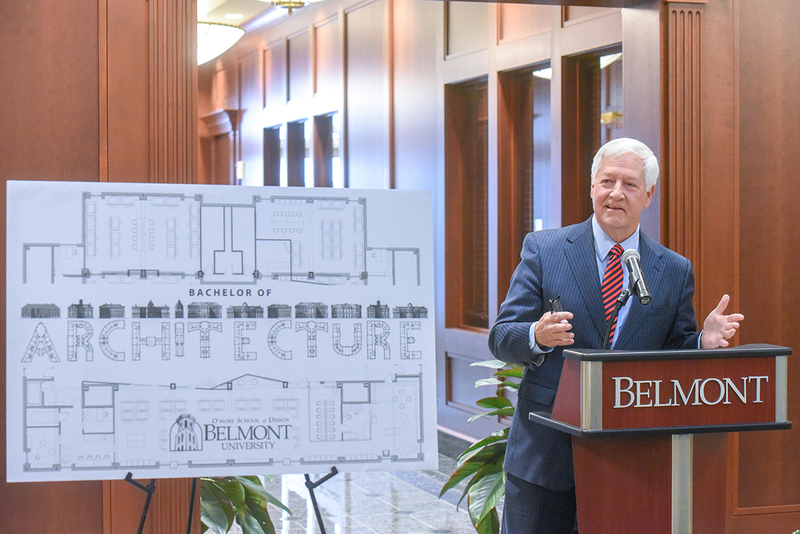 Along with the performing arts, more public art will be brought to the complex through a partnership with ArtsMemphis and the Urban Art Commission, as well as private contributions. In order to establish these goals, the Memphis Meeting Planners Advisory Board met with convention and event planners from around the country. Along with this research, feasibility studies conducted in 2010 and 2011 found that redeveloping rather than moving or rebuilding the convention center would be more cost effective while achieving the same goals. Another advantage of not moving the complex is that through careful phasing, both the Convention Center and the Cannon Center will be able to host events throughout construction. Other portions of the city are set to be transformed through major infrastructural improvements in multiple neighborhoods, and TIF districts will be expanded to help pay for the improvements. With work beginning in earnest this year, Memphis will be a changed city by 2019. 2017 Best of Design Awards for Workplace – Interior: Memphis Teacher Residency Architect: archimania Location: Memphis, Tennessee A faith-based nonprofit organization required a space for recruitment, training, and supporting teachers through an urban teacher residency graduate program. Their new space is positioned between a large public central atrium and a more intimate atrium: a recently renovated distribution center. The space is made up of three functions: offices, larger training rooms, and community areas. Wooden space-defining elements were used within the community spaces to encourage gathering. These components act as connective tissue between programmatic zones. At the entry, a sign and a seating detail offer areas for conversation and define the entrance. The client’s distinct use of book icons to express a source of knowledge was also translated into an architectural language and spatial detailing that color and meter the space. 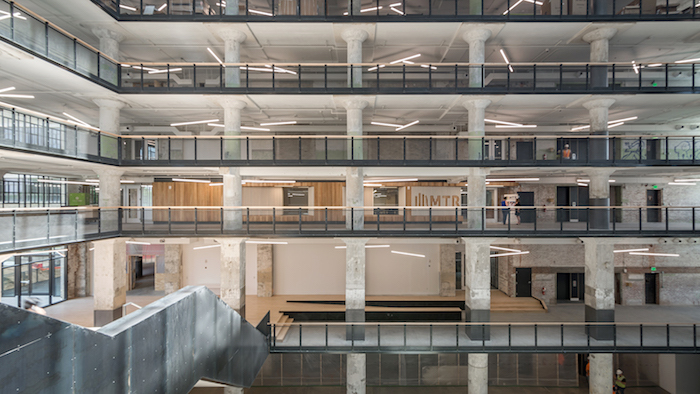 "I love the project's light touch—it celebrates the industrial character of the existing building without being too self-conscious." —Eric Bunge, principal, nARCHITECTS (juror) General contractor: Grinder, Taber & Grinder Engineering: OGCB Honorable Mention Project Name: RDC-S111 Urban Office Designer: Retail Design Collaborative Location: Long Beach, California A vacant department store became a 34,100-square-foot creative workplace based on the concept of an “urban gallery.” Twenty skylights offer natural daylight and ventilation while reducing artificial lighting needs. A mezzanine wraps the perimeter of the interior space, creating a “bridgewalk” overlook, while a portion of the service dock is transformed into an urban garden. 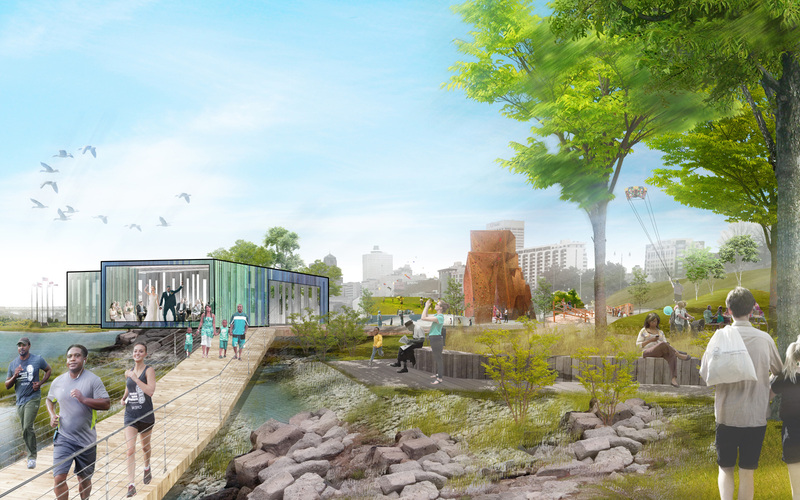 Chicago-based Studio Gang Architects has released an extensive outline envisioning the future of Memphis, Tennessee's Mississippi riverfront. Studio Gang’s Memphis Riverfront Concept is a broad framework spanning six miles of the east bank of the river. Divided into five zones—Fourth Bluff, Mud Island, Tom Lee Park, M.L.K. Park, and Greenbelt Park—the Riverfront Concept is designed to re-link the city’s downtown to the underutilized waterfront. The plan calls for changes, large and small, ranging from new park buildings to major ecological remediation. Many of the changes proposed are meant to build on the things people in Memphis already enjoy about the river. Throughout the design process, Studio Gang worked with the public and the Mayor’s Riverfront Task Force to gauge interest and gain insights into the future role of the river in the city. Based on community suggestions, the plan calls for enhancing views across the river, year-round attractions, additional family spaces, and various bike and pedestrian paths. Picturesque sunsets, barbecue, and the blues—just a few of Memphis's favorite pastimes—were all considered in the plan. For example, Tom Lee Park's new adventure playground and waterfront pavilions aim to be catalysts for the generally quiet park. Currently, the park is primarily programmed for a month-long fair each year. Studio Gang hopes that the Riverfront Concept will make it a year-round destination. The namesake of the park, Tom Lee, is a local African-American hero. Along with the Memphis-based National Civil Rights Museum, the plan proposes a “Civil Rights History Loop.” The riverfront has always been of historical significance to the city. Not only was the riverfront the site of the settlement which eventually became the city, trade along the river was the driving economic force for most of the Memphis's history. The Riverfront Concept hopes to reignite interest in the Mississippi River while reflecting back on its past importance. Among other areas that will see major changes is Mud Island—a peninsula in the river—which has been re-imagined as an Eco Hub. Currently, the area is a cultural center in the city and includes portions of the University of Memphis, as well as the Mississippi River Museum and an outdoor amphitheater. The Riverfront Concept includes learning and research areas, as well as ideas about institutional collaboration. Considering the Mississippi River watershed constitutes nearly 40 percent of the United States surface freshwater, Studio Gang argues that Memphis is an ideal location for freshwater studies. The Memphis Riverfront Concept is meant to be a starting point for much larger changes for the city. Over the past 60 years, Memphis's population has moved further and further east, away from the river. The Riverfront Concept aims to re-center the focus of the city on its historic starting point along the bluffs of the river and provide an expansive shared amenity. To do so, Studio Gang developed three design principles: foster, restore, connect. Each of these principals was constructed through discourse with the public and city officials. The "foster" principle focuses on bringing the public together and encouraging civic pride and appreciation for the river. "Restore" focuses on bringing back native ecological conditions and allowing the public to better understand the river system. The "connect" principle sets goals for bridging the divide between the city and the river, physically and culturally. 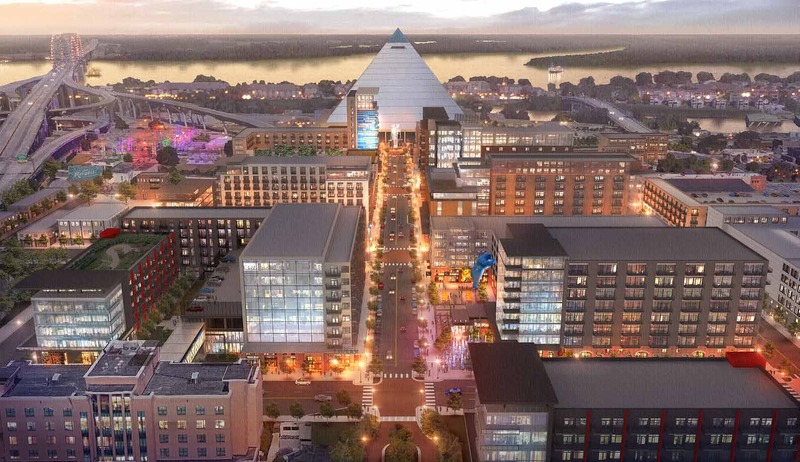 The entire 140-page Memphis Riverfront Concept is available online for the public to view. New animations and renderings have been released for the multi-phase modernization of the Memphis International Airport (MEM). The new images focus on revitalizing the airport's B Concourse, where eventually all airlines, retail, and food businesses will be consolidated. The initial plans for renovation, which were initiated in 2014, called for the partial modernization and reuse of the existing B Concourse. The latest involves a nearly complete redesign of the entire wing of the airport. A handful of amenities will be added to the concourse, including wider corridors, moving walkways, enlarged and updated boarding areas, and higher ceilings with more natural light. The modernization will also include a much-needed seismic update. The overhaul of the airport also involves altering and removing sections of the A and C concourses to allow for easier aircraft access to the B Concourse. “This is a lengthy, complex process, and it’s crucial that we do it right in order to deliver the best possible airport experience for Memphis travelers,” said Pace Cooper, chairman of the Memphis-Shelby County Airport Authority Board of Commissioners in a press release. “We’ve made progress thus far, and more significant changes are on the horizon. These changes are all part of a project that will result in a modern, convenient, state-of-the-art airport for our passengers, airlines, concessionaires, and other partners.” The announcement also included the expansion of the project to a handful of related projects around the airport, including jet bridge construction and electrical upgrades to other concourses to facilitate additional airline operations. The $214 million project is being realized without tapping local public tax funds, though much of the project will be funded by state and federal grants. The remainder of the funding will come from the airport's operating budget and the issuance of revenue bonds. Once complete, most airport operations in the A and C Concourses will be slowly moved into the newly renovated B Concourse. Construction is expected to begin by early 2018 and continue through early 2021. By mid-2021, consolidation will be complete and the end portion of the C Concourse will be removed. The video below flies through the future new and improved B Concourse. In anticipation of its bicentennial in 2019, Memphis, Tennessee is taking big steps to revitalize one of its oldest neighborhoods. The downtown Pinch District was part of the city’s original plan, but for much of the last 40 years it has seen very little development. In fact, since July 2015 there has been a moratorium on new building permits and additional construction to existing buildings in the area. The Pinch District Concept Study has been put together by the city’s Division of Housing and Community Development, the Memphis/Shelby County Office of Planning and Development, and the Downtown Memphis Commission, with architecture and planning being handled by the Memphis office of Looney Ricks Kiss. With a recent unanimous approval by the Land Use Control Board (LUCB), the study is on its way to the Memphis City Council. While in front of the LUCB, a resolution was added to the study to ensure that the master plan would act as an outline for future development rather than a true set of building regulations. If the study is approved by the City Council, the moratorium will likely be lifted, much to the pleasure of current Pinch land owners. The study covers a nine-block area and calls for a diverse set of programs integrated into a mixed-use neighborhood. The proposed neighborhood is based on four main principles: "history/character," "connected," "mixed-use," and "walkable neighborhood." Pedestrian friendly streets, intersections, and green spaces are an important part of the plan. Additional connections to the Mississippi River, which runs just west of the site, and to the rest of the downtown under the I-40 expressway are also highlighted in the study. While the neighborhood is decidedly underdeveloped, considering its location's history, one major recent development looms over the Pinch. The Pyramid Arena, built in 1991, sits between the neighborhood and the water. When it was built, it was imagined that the area would be transformed into an entertainment district. After multiple attempts and failed plans through the late 1990s, the push was mostly abandoned. Originally it was used as a 20,142-seat sporting venue for the University of Memphis men’s basketball, as well as the NBA’s Memphis Grizzlies. Eventually, a new stadium built on the south side of the downtown left the Pyramid vacant. In 2015 the Pyramid reopened as a Bass Pro Shops megastore and hotel. It should be noted that Memphis is the second Memphis, after the ancient Egyptian city, so the pyramid sort of makes sense. The Pinch itself was one of the first landing places for numerous immigrant populations including Irish, Italian, Russian, Greek, and Jewish communities. The name Pinch comes from the nickname of "Pinch-Gut" given to the area as a derogatory reference to the starving emaciated Irish immigrants escaping the potato famine of the mid-1800s. While the new vision of the Pinch still has a long way to go before being realized, it would seem the area may be entering a new era in its long history. Tennessee-based Branch Technology has announced it will begin construction of a 3D-printed house in 2017. Designed by Honolulu-based WATG, the project was initiated for the Freeform Home Design Challenge, which asked participants to design for Branch’s Cellular Fabrication (C-Fab) 3D printing technology. The small house designs were required to be between 600 and 800 square feet. Branch’s C-Fab technology involves 3D printing carbon-fiber-reinforced ABS plastic with a large robotic arm. The resulting formwork can then be covered in more traditional building materials, such as concrete or foam. Instead of the typical completely 3D printed additive technique, C-Fab uses an algorithm to formulate an interior framework for the structure. WATG’s design, entitled Curve Appeal, will be built at Branch Technology’s lab in Chattanooga, Tennessee. The house is comprised of a curving shell around an open plan. The form of the building also provides a car port. The interior of the house is divided up with class walls and a solid core. Skywalks, or elevated sidewalks, continually resurface as an urban solution to alleviate pedestrian traffic, provide additional retail space, and offer a safe alternative to sharing space with automobiles. However, each time a skywalk is actually realized, problems abound. The original elevated sidewalks are in Chester, England, and are believed to have been built in at least one iteration in the 13th century. Historians are unsure if the elevated sidewalks were implemented for retail opportunities or as flooding precaution, or both. Protected as a heritage site today, the Chester Rows inspired several master plans in the United States, particularly at the turn of the 20th century. In 1913, Scientific American published “The Elevated Sidewalk: How it Will Solve City Transportation Problems,” which made the logical claim that humans and cars shouldn’t be in the same place. Imposing traffic regulations would slow cars down, and having people and cars sharing the streets is dangerous. The proposal was to make Manhattan a “city of bridges” with pedestrians moving safely above ground while cars sped underneath. Yet this never happened in lieu of the signs and traffic regulations we use today. In the '60s, the idea of the elevated sidewalk resurged in nearly two dozen towns, including rather unlikely places such as Cincinnati, Ohio, Minneapolis, Minnesota, and Morristown, Tennessee. The Minneapolis Skyway system was built in 1962 and had the added benefit of providing a climate-controlled path through the city in intense weather. For that same reason, St. Paul also implemented a similar Skyway. However, the pros are offset by some solid drawbacks—property disputes mean that it is often confusing as to who is responsible for maintaining the skywalks and a lack of commercial real estate along the walkways renders them desolate and perceived by the public as dangerous and crime-filled. Poor planning means that the sidewalks can be confusing and require maps; one example in particular is the “skyway to nowhere” on Wabasha Street in Minneapolis, which doesn’t connect to anything at all. 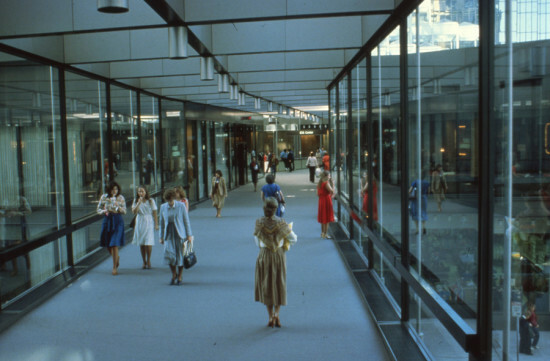 Inspired by Minneapolis, the city of Cincinnati created its own robust skywalk system that opened in 1971 to help downtown retailers compete with enclosed malls and make it easier to navigate the downtown area. More segments were added well through the '90s, and for awhile, appear to be used quite regularly. But by 2002, the skywalks were falling into disrepair and the city’s “2002 Center City Plan” found that they actually were causing downtown economic activity to decline. The plan reported that when pedestrians bypassed the street, it made the downtown look abandoned and thus, a less desirable place to linger and spend money. In 2005, then-mayor Charlie Luken told The New York Times that the Skywalk is "ugly" and the space underneath is "yucky." The skyway is slowly being dismantled one chunk at a time. Morristown is particularly fraught over its elevated skywalk system, called the SkyMart, that was built in 1962 after the downtown was flooded and the commercial district was nearly wiped out. As was commonly the case around the country, the walkway system did not succeed in competing with malls, proved to be expensive to maintain, and, overall, did not live up to the expectations of the civic leaders. In one camp, supporters believe it is unique to the city and a “national treasure.” The other side deems it to be a hindrance to progress, unnecessarily expensive, and underused. It was submitted to the National Register of Historic Places in the early 1990s, but it was denied. Recently, the East Tennessee Preservation Alliance posted an article on Facebook in support of the SkyMart. Comments in response offer insight into the local’s perspective. “Oh, are there businesses on the second level?” asked a commenter. “Yes! Downtown Crossroads Association’s office is on the skywalk,” responded another. “One?” the original commenter replied. There was no response. This seems to be the wide sweeping problem in all cities with elevated skywalks. Instead of bustling hubs of commerce and safe, weather-protected passageways through cities, they are deserted, confusing, and/or dangerous. Similar issues arise in tunnel systems built in cities like Dallas and Houston. "It was the worst urban planning decision that Dallas has ever made. They thought it was hip and groovy to create an underground community, but it was a death knell," Dallas Mayor Laura Miller told The New York Times in 2005. It’s a little unclear to us why this seems to be the case over and over again. Successful skywalks exist in Hong Kong, Copenhagen recently installed a popular bike skyway, and Mumbai is currently building out its skywalk system that, while controversial, is actively being used. Population density of American cities versus Asian or European cities or simple human preferences of habit could contribute to their failure. Let AN know: Why do you think skywalks have been unsuccessful? Alternatively, if you know of a successful skywalk, tell us about it in the comments below. While major cities in Europe and across the world are experimenting with the car-free lifestyle, the American South is not likely on anyone's radar as the next to embrace the trend. A neighborhood in Nashville, Tennessee, however, has promised to not use cars for an entire week, leaving them at home as part of the "Don't Car Campaign." Having started on September 19, 30 participants will go carless until the 25th. “Parking has been a big issue here,” said Jamie Brown, a member of the Nations Neighborhood Association (NNA) board speaking to the Nashville Business Journal. “The residential density is getting higher. One [house] goes down and two or three go up,” she said. “Now we’re starting to see condominium and apartment units." Elaborating on the parking difficulties in the area Brown went on to say: “We’re worried about how [new development] is going to affect our overflow parking in the street. We don’t have sidewalks in our neighborhood. The developers keep telling us this is a walkable neighborhood, saying it’s close to downtown. … We wanted to test that concept.” The NNA campaign to go car-less highlights the outdated transit system currently in place, adjudged by the Nashville MTA as insufficient for the growing local population. The city, according to the Nashville Business Journal, is fortunate in that it is walkable and pedestrian-friendly with plenty of bike lanes. 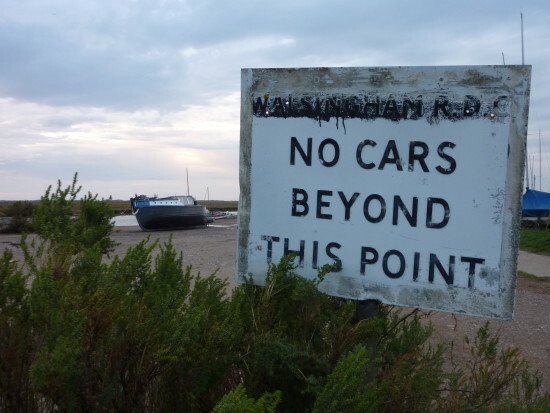 Abstaining from car usage then shouldn't be that much of an issue. “People in other neighborhoods have reached out and told us this is a great idea,” Brown said. “We hope the campaign could be done by other neighborhoods.” The team of 30 who will record and document their experiences seeks to be a leading example of how a population can get by without being dependent on cars. They also want people to start seeing how capable their transportation infrastructure really is.